Notwithstanding successes chalked in the area of scope, financial inclusion and program delivery improvement for the Livelihood Empowerment against Poverty program (LEAP) and the Ghana School Feeding Program (GSFP), there still remain genuine questions about program impact, sustainability and how citizens can add their voice to the effective implementation of the selected social intervention policies. Penplusbytes under its 2 years “Tech Driven Social Accountability for Results” project has deployed new digital tools, which has enabled citizens in the two project districts – Ashaiman (Greater Accra Region) and Ellembelle (Western Region) to actively monitor and provide feedback on how the selected social intervention policies are being implemented in their communities. Feedback collated from citizens’ monitoring using digital tools and offline means have informed the policy brief that the project team from Penplusbytes will be presenting in a roundtable discussion with officials at the Ministry of Gender, Children and Social Protection on Thursday 22nd February 2018. 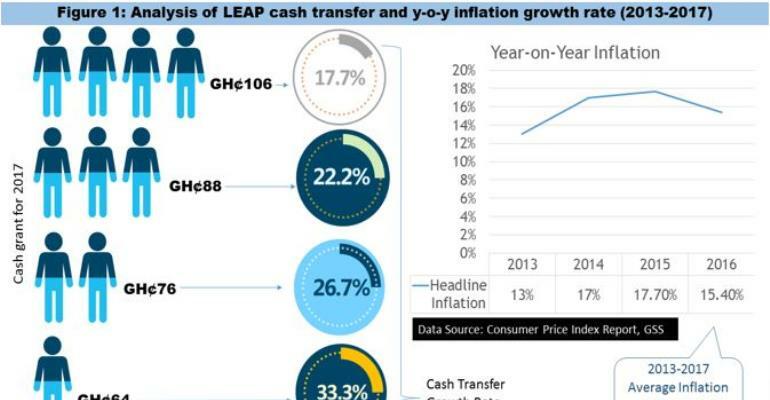 Findings from the monitoring data indicate that the increment of cash transfers by 24.9% across the board between 2013 and 2017 has indeed contributed to cushioning the social safety net for beneficiaries of the LEAP in all 216 districts across Ghana. However, the main risk to program sustainability is weak fiscal performance, considering the dwindling donor grant over the years. LEAP has also impacted positively on access to NHIS, school enrollment, and non-consumption expenditure, among others. GSFP has recorded some meaningful impact on school enrollment and attendance for both sexes, albeit the evidence of its impact on performance, concentration, and discipline is checkered. Another key finding on the GSFP was the fact that caterers were indeed sourcing their foodstuff from local farmers, however, these farmers were said to be unable to meet the capacity requirements of caterers. Although it is not clear whether the capacity shortfall is a quantitative or qualitative, or both, it clearly points out a bottleneck in the agricultural supply chain that needs immediate attention. Recommendations from the brief which are grouped under Policy Innovation; Data Management Capacity and Community Buy-in are expected to help advocate for reforms were necessary for social protection policymaking, by directly capturing the needs of citizens and document lessons learned on social accountability in Ghana. The 2-year “Tech Driven Social Accountability for Results” project, which is being funded by the Open Society Initiative for West Africa (OSIWA), seeks to equip ordinary citizens with usable information via online platforms mashed-up with social media and mobile-based platforms to promote their purposeful participation in demanding accountability and responsiveness from decision makers for effective public service delivery.